Hi, I’m Lulu! I’ve long been a chocoholic but back in 2006 I realized I had to give up sugar. I thought this meant the end of chocolate until I had my first experience with a raw cacao tree in Hawaii. It changed my life forever and my passion since has been to share chocolate with the world as the pure, whole food that it truly is. As a foodie who loves nutrition, I pride my brand on bridging the gap between gourmet and truly healthy. Seems folks agree, as Lulu’s Chocolate went from being a cottage industry level business to a national brand. I share my entire journey on my blog, in hopes of inspiring others to go for their dreams…and of course, to eat more chocolate. Cheers! We choose unroasted (raw) cacao in order to maximize cacao’s amazing qualities from tree to table. Our cacao is 100% wild-harvested, heirloom Arriba from Ecuador & we have a direct relationship with our suppliers. FARMERS ARE PAID A LIVING WAGE TO HAND HARVEST THE WILD CACAO PODS. Each ingredient is sourced mindfully based on quality, sustainability and flavor. All of our DELICIOUS products are certified organic, vegan, gluten free, soy free, fair trade & sweetened with low glycemic coconut sugar. Our cacao exceeds California requirements for purity and is Prop 65 compliant. We are happy to provide our cacao purity reports upon request. Our packaging is compostable and/or 100% recycled and printed with veggie ink. Our product is HowGood Certified, meaning it meets very strict sustainability standards. We donate product, as well as 1% of annual profits, to charity. When we say handcrafted with heart, we mean it…that’s why we list love as an ingredient. Lulu has been eating 1-3oz of lulu’s chocolate per day since 2006. Not only does cacao provide a natural high, boosting your PEA, dopamine and Anandamide (your brain’s natural feel good chemicals), it is also a health food! Cacao is one of nature’s richest sources of Antioxidants & Minerals. It is also nature’s primary source of Magnesium, making it true Heart Medicine. Magnesium is much needed by the heart as it decreases blood coagulation, which lowers blood pressure and helps the heart pump more effectively. 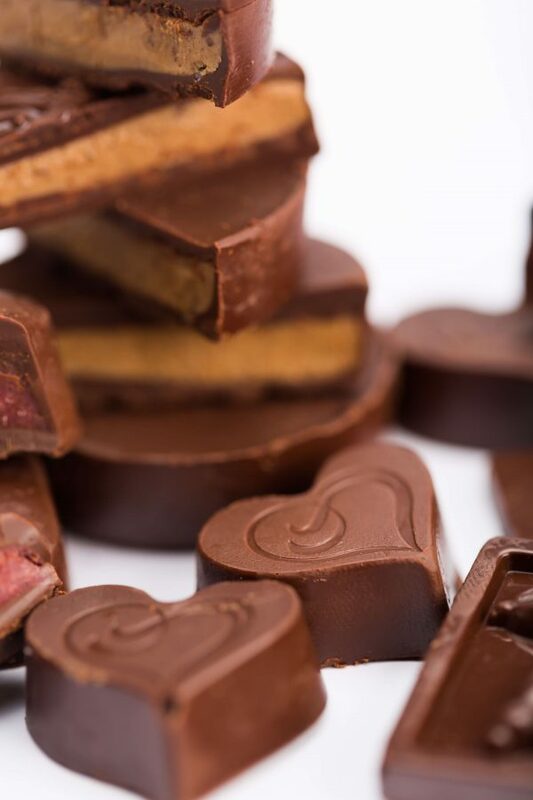 So it is actually true that “CHOCOLATE OPENS THE HEART!” Magnesium also helps build bones and increases brain power, helping to Activate Your Superpowers! Ladies, your intuition is right on (of course) when you want chocolate for moon time. We love its’ hormone balancing effects and natural endorphins. Our wise bodies crave the magnesium boost. Chocolate Yoga? Oh ya! Magnesium increases flexibility and strength. We love it before our morning yoga or any exercise. Lulu’s daily breakfast is a Midnight Velvet bar! Did you know about the beauty benefits of dark chocolate? Cacao hydrates your body from the inside out, providing natural moisture to your skin. It can also help you lose weight. What?!? True. Ever notice that cocoa powder is in most weight loss products on the market? This is due to it’s MAO inhibitors, which curb the appetite naturally. It is real food and we think it makes a marvelous meal. Most importantly, chocolate so often makes one smile, which radiates your natural beauty full force. Receive exclusive coupons, get first dibs on our limited edition items & be entered in monthly raffles for free chocolate. Email Frequency: 1x per week max. We love privacy & hate spam.